Crock Pot Coq au Vin is Coq au Vin made in your crock pot. Sounds fancy, but it's actually a very simply dish that's easy to make. And it's even easier in your slow cooker. Coq au vin, pronounced “coco van,” is a hearty winter dish of chicken braised in wine, lardons (bacon,) mushrooms, and garlic. The word coq means rooster in French, and this dish was traditionally made with a rooster or tough, older hen. It's a rustic “peasant” meal but it's fancy enough to serve at a dinner party. 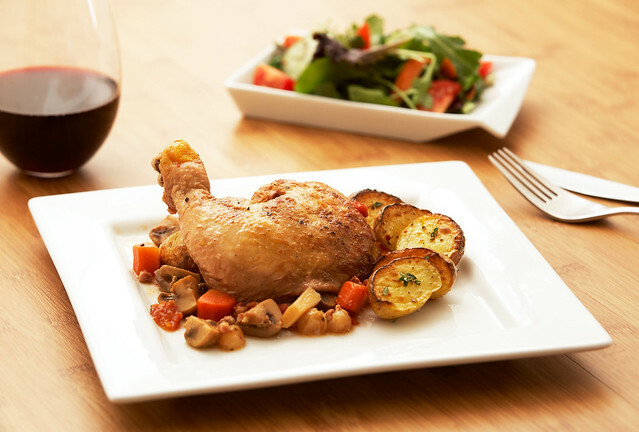 While the wine used in the dish is typically from the Burgundy region, many regions of France have variants of coq au vin using the local wine. A medium-bodied red table wine such as a Côtes du Rhône or a California merlot will work well with this dish. As far as what to serve with the coq au vin, it's a good idea to serve some crusty sourdough bread to sop up the sauce. A plain green salad would also be a fine accompaniment. And of course, a decent red wine to drink. 1. Fry the bacon in a skillet over medium heat until crisp, about 8 minutes. 2. Transfer the bacon to a paper-towel lined plate, leaving all but 2 tablespoons of fat in the skillet. Refrigerate bacon until serving time. 3. Peel the onions and garlic cloves. Mince the onions and crush the garlic. 4. Add the onions, garlic, tomato paste, thyme and 1/4 teaspoon of sea salt to the skillet. Cook, stirring often, until the onions are softened and lightly browned, about 8 to 10 minutes. 5. Stir in the bottle of wine, scraping up any browned bits, and cook until the mixture has reduced down to about 3 cups, another 8 to 10 minutes. 6. Transfer the mixture to your crock pot or slow cooker and stir in the arrowroot and bay leaves until evenly combined. 7. Season the chicken with sea salt and black pepper and arrange in the slow cooker. Cover and cook on low until the meat is tender, about 4 to 5 hours. 8. Thaw the pearl onions and take out the mushrooms. If the mushrooms are small, cut in half. If they are large, cut them into quarters. 9. About 20 minutes before serving, bring the pearl onions, 1/2 cup of filtered water, butter and coconut sugar or honey to a boil in a skillet over medium-high heat. 10. Reduce the heat to medium, cover, and cook until the onions are tender, about 5 to 8 minutes. 11. Uncover, increase the heat to medium-high, and cook until all the liquid evaporates, 3 to 4 minutes. 12. Add the mushrooms and 1/4 teaspoon of sea salt to the mixture. 13. Cook, stirring often, until the vegetables are browned and glazed, 8 to 12 minutes. Remove from the heat and set aside. 14. Remove the bay leaves from the crock pot, stir in the pearl onion mixture, and season with sea salt and black pepper to taste. 15. Crumble the bacon. Ladle the stew into individual bowls and sprinkle each bowl evenly with bacon crumbles. I just made beef bourginone and wanted to make some coq au vin, but I am going back to school tomorrow and won’t have time to stay near the oven! I am printing this out and will try it in my crock pot!! Thanks AnneMarie! It is actually worth mentioning that if you are homesteading and are using an old bird for real- you need to marinated the meat in the wine for several days. Nobody includes that very important tidbit in recipes anymore and it can cause some major dinner problems. I also have used Reisling in place of red wine and it turned out really yummy. I LOVE coq au vin! It’s my absolute favorite. Last time I made it, I actually used Ina Garten’s recipe as a base, and by the time I WAPF-afied it, it was very similar to your recipe. I’ll write a post about it soon.